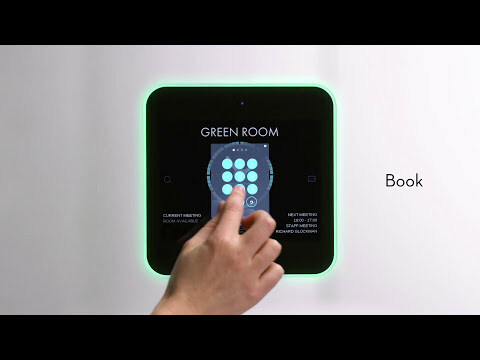 Evoko Liso revolutionises the way you meet by taking the hassle out of room bookings. It's a fantastic, intuitive touch-screen solution for all your meeting rooms. No more double bookings, confusion and interrupted meetings. The latest generation Evoko Liso is even brighter and lovelier to look at. With the same mission as ever – making sure all your meeting rooms are being used in a truly effective way. Evoko Liso makes it easier than ever to book a room with your favourite digital calendar, directly on the screen using your fingertip or on the go using the Get A Room app. Now we are taking the intuitive user interface to a whole new level. All information is elegantly presented on the screen and it actually changes information on the display when someone walks up to it, always displaying the most relevant information. Easily book, end or extend a meeting or use the calendar to search for other rooms based on availability, size and equipment. Thanks to the green and red light aura you can see at a glance if the room is vacant or not. No more confusion or double bookings. Evoko Liso gives you full insight into your organisation's meeting patterns to really optimise resources. You get decision-making support that truly cuts cost by analysing statistics in the web-based Evoko Home - now more comprehensive than ever. Make sure you use the perfect room for every single meeting. Evoko Home also offers extensive multi-site management options with permission control and real-time monitoring of the units. It has never been easier to open the door to a much more efficient meeting culture.